I actually intended to post this rhubarb cocktail for the Easter weekend. But you probably know how things are going sometimes. There was so much going on and in the end I didn’t make it in time. 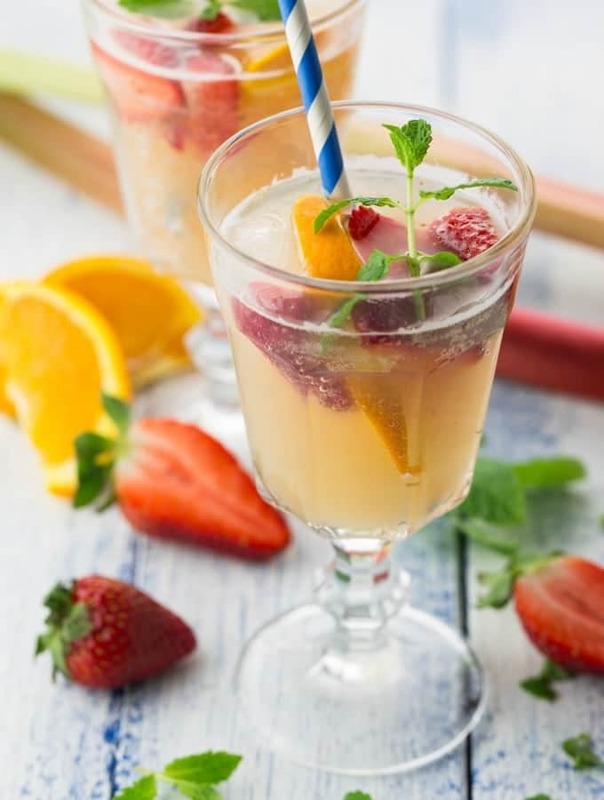 So say hello to this post-Easter rhubarb cocktail with strawberries and mint. It’s the perfect spring cocktail to relax after a long day at work. Or enjoy it at your next BBQ! The rhubarb gives it a unique sweet and sour taste that makes it great for warm days. I’ve always loved rhubarb. My grandma used to grow it in her garden and as a kid I would just go get some and eat the whole stalk. I still remember everybody looking at me a bit weirdly when I did that. Most people don’t like the sour taste of raw rhubarb, but I somehow really love it! But don’t worry, for this rhubarb cocktail I cooked the rhubarb with brown sugar to make rhubarb puree. Just cook it for about 3-5 minutes on high heat. Then either use an immersion blender or transfer it to your blender. I also added some strawberries and fresh orange juice to the puree. 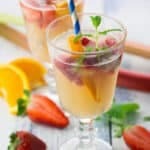 Let the rhubarb puree cool down for a bit and then just add sparkling wine, fresh strawberries, orange slices, and mint. That’s it! The recipe for this spring cocktail really couldn’t be much easier. Oh, and don’t forget to throw in some ice cubes. I mean it’s spring and it’s getting warmer, so we don’t wanna forget our ice cubes, right?! I’m so glad the weather finally gets better and I’m able to spend more time outside. This winter was just waaay too long and spring is definitely my favorite season by far! We didn’t have the best weather over the Easter weekend (it was actually pretty cold! ), but last weekend I was even wearing shorts! Well I hope you all have a great week and like this spring cocktail as much as I do! Embrace spring with this easy rhubarb cocktail with strawberries and mint! 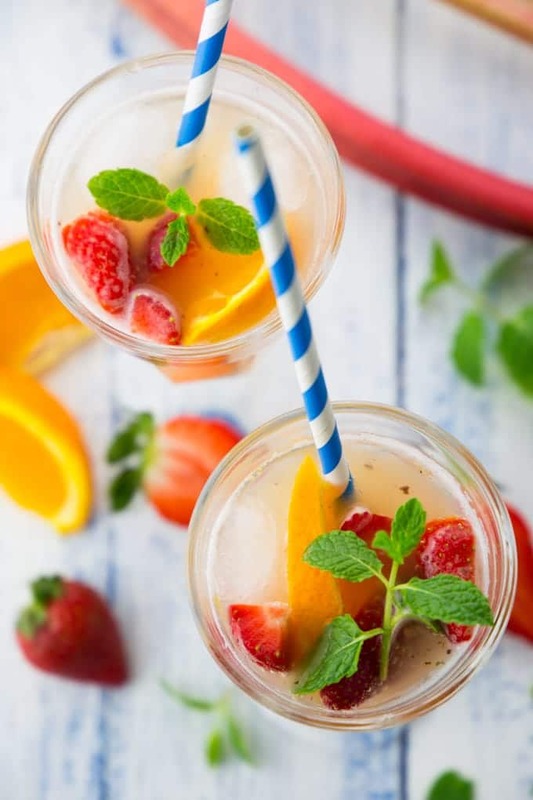 Its unique sweet and sour taste makes it perfect for warm spring and summer days! 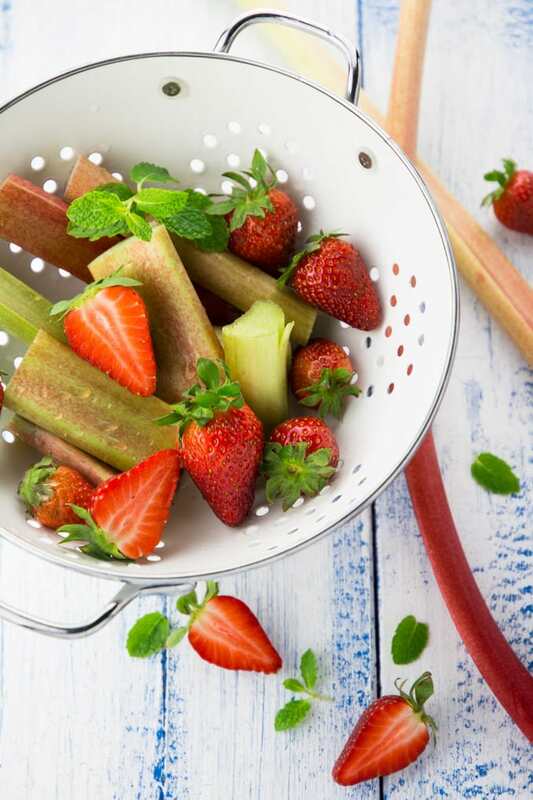 In a small pot, cook the rhubarb with the brown sugar, the water, and about half of the strawberries for about 3-5 minutes on high heat. After cooking, add the orange juice and either use an immersion blender or transfer it to your blender to puree it. Let it cool down for a bit. 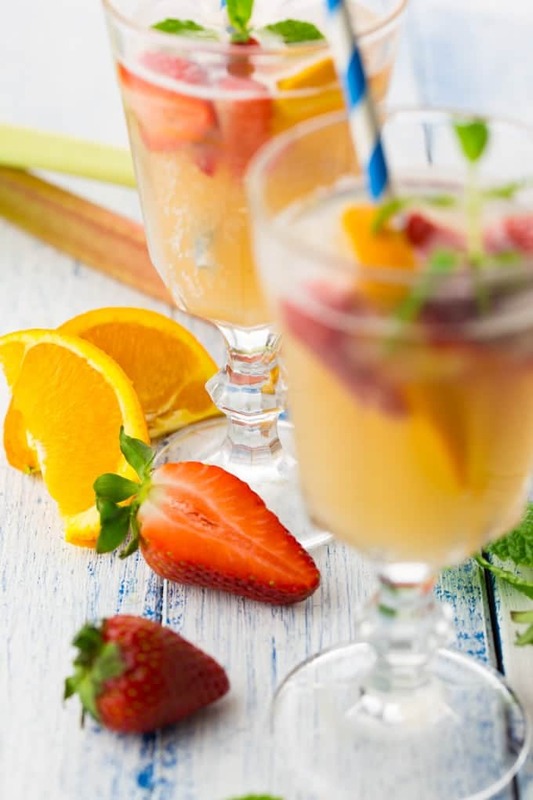 Add 3 tablespoons of the rhubarb puree to each glass and evenly divide the sparkling wine. 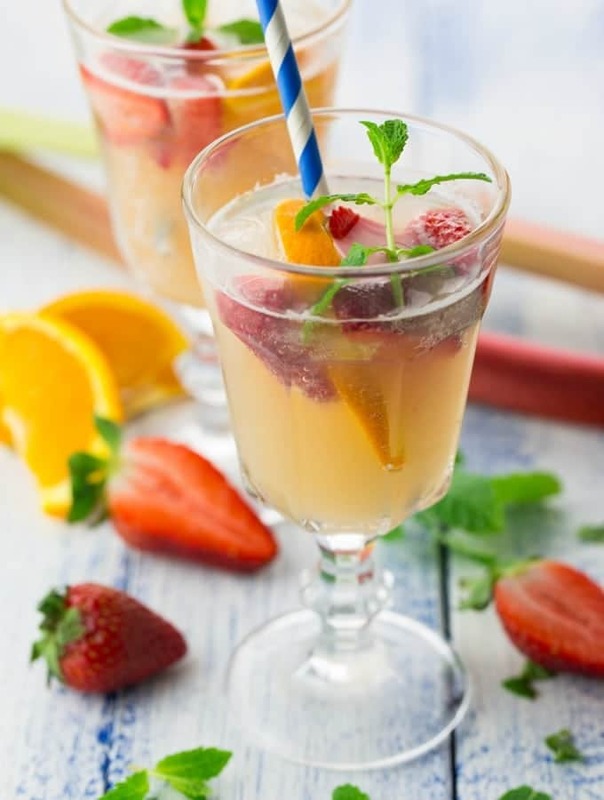 Serve the rhubarb cocktail with fresh strawberries, orange slices, mint leaves, and ice cubes. Enjoy! This recipe makes 4 rhubarb spring cocktails. So refreshing! Didn’t have rhubarb so I used peaches instead and it came out great. Thanks for the recipe!